Compliance in IT is not new and laws regulating how organizations should manage their customer data exist such as: HIPPA, PCI, SCADA and Network transaction logging has begun to be required of business. Insurance companies are gearing up to qualify businesses by the information they retain to protect their services and customer information. Government and industry regulations and enforcement are becoming increasingly stringent. Most recently many countries have begun to implement Mandatory Data Retention laws for telecom service providers. Governments require a mandatory data retention scheme because more and more crime is moving online from the physical world and ISP‘s are keeping less data and retaining it for a shorter time. This negatively impacts the investigative capabilities of law enforcement and security agencies that need timely information to help save lives by early spotting lone-wolf terrorists or protect vulnerable members of society from abuse by sexual deviants, ransomware or other crimes online. Although there is no doubt as to the value of mandatory data retention schemes they are not without justifiable privacy, human rights and expense concerns to implement. It takes a lot of cash, time and skills that many ISP’s and companies simply cannot afford. Internet and managed service providers and large organizations must take proper precautions to remain in compliance. Heavy fines, license and certification issues and other penalties can result from non-compliance with mandatory data retention requirements. According to the Australian Attorney-General’s Department, Australian telecommunications companies must keep a limited set of metadata for two years. Metadata is information about a communication (the who, when, where and how)—not the content or substance of a communication (the what). A commentator from the Sydney morning herald qualified“…Security, intelligence and law enforcement access to metadata which overrides personal privacy is now in contention worldwide…” and speculated that with the introduction of Australian metadata laws that “…this country’s entire communications industry will be turned into a surveillance and monitoring arm of at least 21 agencies of executive government. …”. In Australia many smaller ISP’s are fearful that failing to comply will send them out of business. Internet Australia’s Laurie Patton said, “It’s such a complicated and fundamentally flawed piece of legislation that there are hundreds of ISPs out there that are still struggling to understand what they’ve got to do”. An important cost to consider in compliance is the ease of data reporting when requested by government or corporate compliance teams to produce information for a specific ipv4 or ipv6 address. If the data is stored in a data-warehouse that is difficult to filter this may cause the service provider to incur penalties or be seen to be non-complying. Flexible filtering and automated reporting is therefore critical to produce the forensics required for the compliance in a timely and cost effective manner. Although there are different laws governing different countries the main requirement of mandatory data retention laws at ISP’s is to maintain sufficient information at a granular level in order to assist governments in finding bad actors such as terrorists, corporate espionage, ransom-ware and pedophiles. In some countries this means that telcos are required to keep data of the IP addresses users connect to, for up to 10 weeks and in others just the totals of subscriber usage for each IP used for up to 2 years. Although information remains local to each country and governed by relevant privacy laws, the benefits to law enforcement in the future will eventually provide the ability to have the visibility to track relayed data such as communications used by Tor Browsers, Onion routers and Freenet beyond their relay and exit nodes. There is no doubt in my mind that with heightened states of security and increasing online crime there is a global need for governments to intervene with online surveillance to protect children from exploitation, reduce terrorism and to build defensible infrastructures whilst at the same time implementing data retention systems that have the inbuilt smarts to enable a balance between compliance and privacy rather than just a blanket catch all. There is already an available solution for the Internet communications component based on Netflow that assists ISP’s to quickly comply at a low cost whilst properly allowing data retention rules to be implemented to limit intruding on an individual’s privacy. NetFlow solutions are cheap to deploy and are not required to be deployed at every interface such as a packet analyzer and can use the existing router, switch or firewall investment to provide continuous network monitoring across the enterprise, providing the service provider or organization with powerful tools for data retention compliance. Compared to other analysis solutions, NetFlow can fill in the gaps where other technologies cannot deliver. 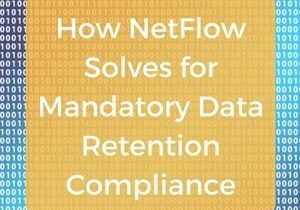 A well-architected NetFlow solution can provide a comprehensive landscape of tools to help business and service providers to achieve and maintain data retention compliance for a wide range of government and industry regulations.